In agriculture, farms are typically passed down from generation to generation – and dairy farms are no exception. These days, it’s unusual for a dairy farmer to start their own dairy. But that’s just what Jesús and Emma Miramontes did eight years ago. After spending 27 years caring for other dairy farmers’ cows, Jesús looked at his wife Emma one day and said, “Why don’t we just get our own cows and go for it?” So they did. They started Miramontes Farm with 80 cows and through hard work, excellent cow care, and teamwork, they are now milking 400 cows in Grants Pass, Oregon. Before coming to the United States as teens, the Miramontes’ farming roots started in Mexico where Emma’s grandmother had a few farm animals. Jesús really enjoys the cows. 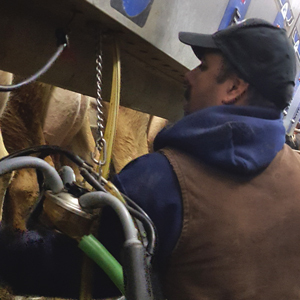 He’s had strong mentorship from dairy farmers along the way who taught him about animal husbandry. For Emma, she loves caring for the calves. “I read a lot of [trade] magazines for information. It’s how we learn. There’s something new to learn every day,” she said. When asked about some important lessons they have learned over the years, Emma responded without hesitation, “Working as a team.” Jesús and Emma have built their dairy while raising their three children, Manuel, Nancy, and Noah. She said there are good days and bad days in the dairy industry, but regardless the Miramontes family comes together as a team.